Mindfulness is a word that’s tossed around a lot lately. We could even call it trendy, but the core values behind the notion are not and are indeed worth noting. Being mindful of something means nothing more than taking stock in it, slowing down to really appreciate it. Bringing mindfulness into your home is really all about creating spaces that you can enjoy, appreciate, live in and relax. Nearly 7 years ago I moved out of my marital home and started a new journey on my own with my three children. The road has been bumpy at times but I’ve seen some amazing sights from the ground and above. I’ve managed to keep my footing when times have been tough. I’ve managed to keep my wits about me when I thought everything would bottom out. I have always sought those moments and things that I value, savor, and that specifically slow me down. My home is one of those things — it has always been my everything. I’m one who needs to come home to the calm of my own space at the end of the day. And when it isn’t calm, whether due to the noise level created by three children under the same roof or the mess they (mostly) leave in their wake, I cannot relax. I have been known to clean when I am sick so that I can have order around me while I rest and get well. Note: The images below are not my own, have been credited and sourced. In 2012 I left a gorgeous 4,500 square foot home on top of a hill with nearly two beautifully manicured acres and an abundance of mature, healthy green trees. On Sunday mornings my husband would sit on the John Deere and, the in-ground sprinklers would rose through the grasses at dawn, greeting the early sunshine, to keep our lawns looking their best. We could hear the peepers and crickets chanting at night and the sweet melodious tunes of local birds in the early morning. Nature really does make the best alarm clock. Although we had neighbors all around us we could see just the little red barn house at the back of the former surgeon’s property. An unattractive wire fence divided our property. During the wintertime it stood there cold, ugly, bare and punishing until the thick white snows clung to it creating the most sensational patterns. As the weather changed and winter turned to spring, the ugly wire appendage dressed itself in green as the verdant and sinewy vines and stems started their journey upward toward the sky. In the fall the vines began to fruit and mall green pellets formed and grew up into small green globes which eventually turned into stunning ruby colored grapes. 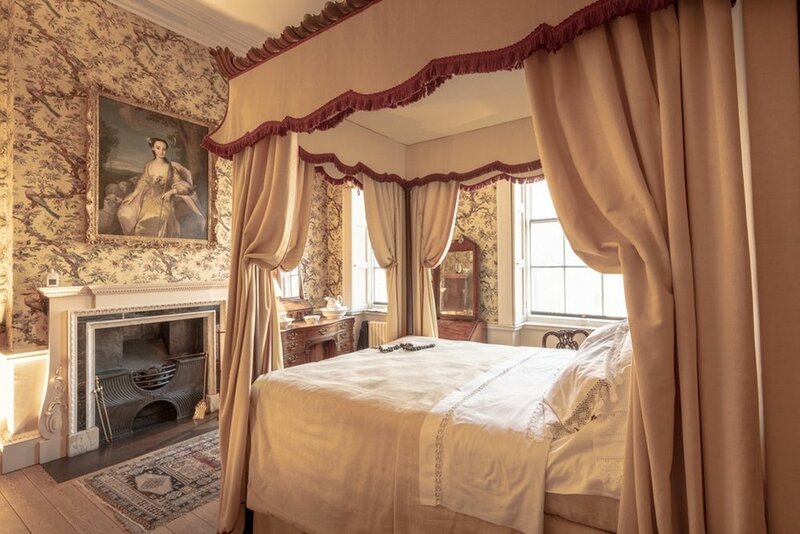 Our home, with its gorgeous bones, spacious rooms and regal setting needed a good bit of updating. While only about 20 years old (new by New England standards) the decor and design were quite dated and not at all our taste. This was a project we would tackle over time, slowly, lovingly. The things we could tackle immediately we did… the repainting, removing carpets, etcetera… Those things needing to wait: renovating bathrooms, kitchen and the massive play room over the 3 car garage. We began in the kitchen as we ripped down worn and faded faux marble wallpaper and replaced it with a coat of fresh leaf green paint. The space was transformed immediately — vibrant with a zen-like energy. The far wall, comprised of mostly windows and the sliding doors just to the left opened up onto a verdant backyard. The skylights over the generously sized eating area opened to the sky. The kitchen felt very much an extension of the outdoors. And despite the high energy and activity level in that room, it was a zen space for me. I do miss that kitchen terribly! Once the kitchen was repainted we went on to tackle the living and dining rooms. The living room, with its deliciously oversized mouldings felt dark and heavy with the dark green plaid fabric walls and even darker, heavier brown floral drapes. The walls were prepped and painted in shadow stripes. I selected two shades of blue, one in a high gloss and the other in a matted hue to create a sense of drama and elegance. We continued the darker below the chair rail. And we never did replace the heavy drapes with any window treatment to allow for the natural light to shine through from the oversized windows. I selected blue with a purpose, for its sense of calm, even with guests in deep conversation, raucous laughter and the clinging and clanging of silver against ceramic or China. I wanted to create a space that was elegant but one which was also comfortable and relaxing, so that guests could comfortably linger over coffee and dessert. Comfort is always a priority of mine. It does nothing to look good or have a space that looks good if one can’t be comfortable. The dining room opened up to the living room, also very generously sized and bright. This room posed a bit more of a problem. The previous homeowners — owners of a large and well known local furniture store — bought heavily into the faux marble trend of the late 80s so much so that the home was covered with it. In this room wallpaper as thick as corrugated cardboard was so well adhered to the walls that we worried about the damage it would cause the walls should we try to take it off. We opted instead to leave it in place and paint over it. In order to do so we removed strips of it at the seams and filled it with a compound that would serve to fill the gaps and seal the seams. After this ordeal had been completed we painted the room in a handsome putty color, ivory gloss mouldings and carried a lighter shade of blue used in the dining room to the living room ceiling to create a sense of continuum. When we removed the godawful faux yellow marbled paint from the fireplace we unveiled and restored the original gorgeous marble. (I mean what were these people thinking?!) This would be the only neutral colored space in the house. With the sun pouring in from three separate directions, the room’s hues were constantly changing - something I thought quite magical. We brought color upstairs into the guest bathroom, the children’s rooms and the Master Bedroom. Working with various hues of blue, lavender, red, pink and green… Downstairs a softer shade of green was brought into a bathroom, yellow was the color I chose for our sunny laundry room and tranquil blue in the family room balanced the rather rustic wood and stone fireplace. Our colors were chosen carefully and methodically so that each space would feel welcoming and relaxing. Ten years ago wallpaper hadn’t become as popular as it is now or I likely would have chosen to paper a couple of the rooms. Without realizing so, I have always used color in my homes to create mindful spaces. These days I tend to gravitate to blues and greens as I find them soothing and grounding whereas in the past have also used shades of yellow, red and pink and would love one day to have one painted black. But alas, I am in a rental now, a white house inside and out and while I’d very much love to repaint every room, and while I’m sure my landlord wouldn’t mind, I’d rather not spend my money enhancing someone else’s property. When I first moved here I quite welcomed the white but I did tire of it rather quickly. I have added color best I can with accessories - pillows, sheets, rugs, flowers. It can be said that although not perfect, my home is indeed my sanctuary. It is a place where I can work, rest and enjoy myself and my children. A mindful home is one where you feel relaxed and at rest, where you can look around and appreciate all that you have. It is one that is not cluttered, overly decorated or relying on decorated trends. A mindful home is one where you feel at peace, safe and comfortable. 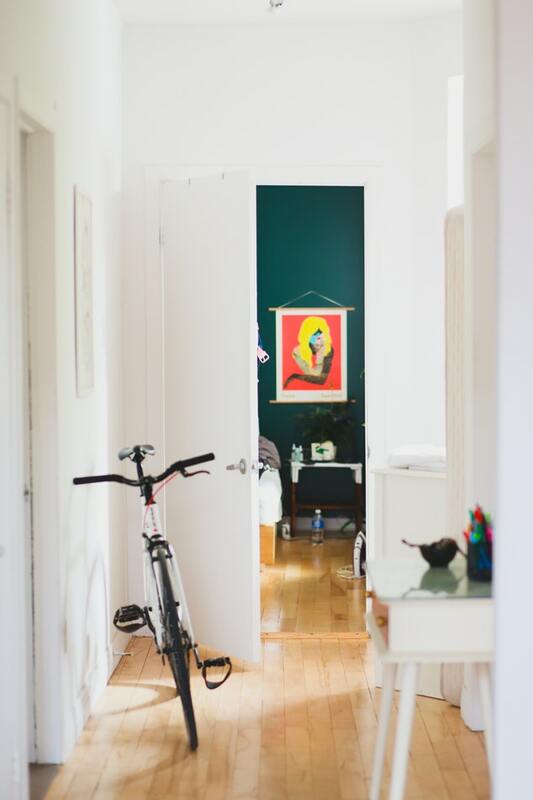 Below, some tips on how to decorate your living spaces mindfully. Life is short, there is no time like the present. I lost a friend the other day. At just 51 she passed away from cardiac arrest. She leaves behind a husband. Two brothers and a sister. And a 12 year old daughter. She’s the second person I know who passed away prematurely due to heart failure. The other was someone near and dear to my heart. It was 6 years ago and he was just 48. His then 12 year old son found him. My heart was broken. For his son, for those he left behind, and for myself. You see, R was an old friend. We met in college and although I had a terrible crush on him he was dating a friend of mine. We lived together briefly after college, with another friend, and then I decided to move out as I decided that living with girls was more my speed. R and I kept in touch for many years but lost touch after children arrived, which I guess is fairly commonplace. We found each other many years later thanks to the onset of Facebook. The term Social Media hadn’t even been created then. His wife “found” me, then he did. A year or so later he reached out to me to let me know that he was going to be in my town for business and might I be able to meet up for a drink or two. We met and it was as though time had stood still all those years. It was such fun to learn what our friends were all up to - Those he still kept in touch with, anyhow. And then he dropped a bombshell. He and his wife were getting divorced. I was shocked to hear this. They had the kind of relationship that most of us envied. Their names were said in unison - as if the two separate names were really just one. And then I revealed a little secret. I too was getting divorced. R became my everything. He was my confidante. He was my Rock of Gibraltar during an incredibly heinous time in my life. He was my closest friend. He was the perfect boyfriend. But he lived too far away and I knew that keeping up our relationship wasn’t really feasible in the immediate future. We remained close. Our boys met. We visited him at his summer place. We spoke on the phone often. I called him to wish him a Happy New Year. I was not terribly shocked when he hadn’t immediately returned my call. I knew he would at some point in the near future. But I never did hear from him - I heard from his sister instead. She had reached out to me via Facebook, much the same way we had gotten back in touch all those years earlier. She wrote me this incredibly sweet and long note telling me just how much I head meant to her brother. R had passed away on New Year’s day from a massive heart attack. He hadn’t been feeling well the night before. His son found him “asleep” in his bed. Aside from the loss of one of my closest friends in a plane crash on Martha’s Vineyard when I was just 22, this was my first ‘grown-up’ loss. It hit me hard on so many fronts. I still think of him often. And now Amy, who also happened to be friends with Mandy, was also taken from us. Another victim of heart disease. We need to live in the moment. We need to enjoy every day. And while every day may not be wholly enjoyable, surely there are parts that are. The time is also now. Because even if you fall it will all have been worth it. Without wanting to sound too terribly cliché, it is indeed better to try and fail than never yo have tried at all. It is indeed better to have loved and lost than never to have loved at all. And I don’t believe in losing. It’s not win or lose. I’ve learned so much in my life and I continue to do so. I may never get it right - and I am ok with that. I want to live with as few regrets as possible. And you? So get out there. Take care of yourselves. Hit the gym. Go for that run, that walk, that bike ride. Eat well. Eat more vegetables. But by all means eat the chocolate too. 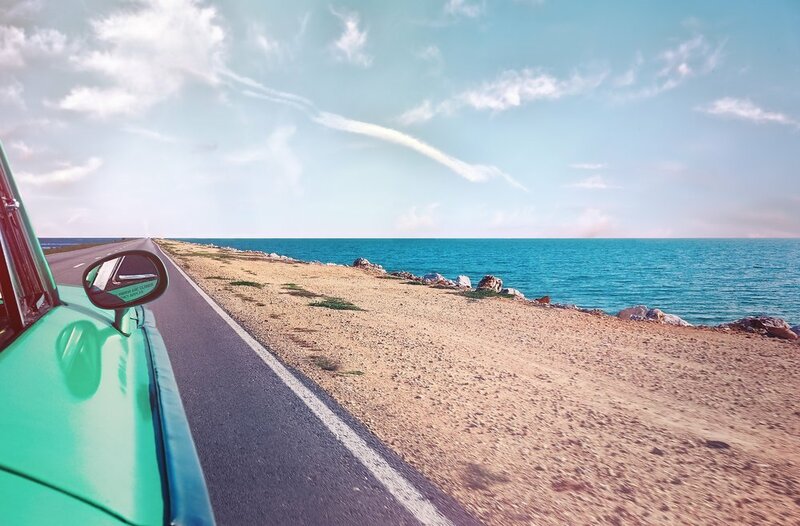 Go take that trip you’ve been wanting to. And go buy the goddamned shoes. There seem to be two sides, those who favor (worship) Marie Kondo and her desire to spark joy, and the rest of us, who grow anxious at the idea of dumping the entire contents of one’s closets, drawers, cupboards, attics, basements and garages into the middle of the living room floor. To this practice I say a hefty, hearty, NO THANK YOU! I could blame my inattentiveness, the fact that I bore and overwhelm easily or the fact that I much prefer to take things slowly, in baby steps. One one hand I am sentimental and have a hard time parting with certain things while on the other hand, I’m accused of tossing everything in sight. In order to understand my way of thinking you must know that when I got divorced I left a 4,500 square foot house and moved into a 1,200 square foot rental for what I thought would be a year or two. I had no idea that I would still be there (here) 6 years later. When we moved in we had almost nothing. We had no furniture, no beds, cleaning supplies… We bought what we needed. I did have artwork and other family treasures and heirlooms. Our home is now full; filled with items that make a house a home. While they say that things shouldn’t define you, cushions on sofas, books on coffee tables, framed photos on mantels are personal touches. From time to time I’ll donate a few of my books, but the majority of them adorn my shelves, desk, some tables. Let’s just say that they spark my joy and I don’t intend on getting rid of them. Ever. My closet is tiny. And I do mean tiny. My clothes are cramped. But I wear almost everything, and I’ve found that sometimes I do give items a rest for a while and return to them a couple of years later. My style tends to be classical - and while with a twist, most of my wardrobe is timeless. I have given items away in the past and then regretted doing so terribly. It’s much more economical to put clothing aside for a couple of years than it is to toss and replace them. While the Millenials don’t want the hand-me-downs of their parents, my kids do. At least my daughter does. I have silver and silverware and a few precious items I know she’s looking forward to one day. I hang on to them for her as well… and indeed, this does spark joy. Now, I am not going to say I don’t need to clear things out. I am indeed overdue. I have toys and games both intact and with missing pieces that I need to get rid of. I admit to having boxes full of old Martha Stewart magazines tucked away in the front hall closet. And boxes with items I’ve not seen or used (or obviously missed) since I moved in. The linen closet needs to be sorted through as does the attic. I don’t even want to think of the childrens rooms. Years ago, maybe even before Marie Kondo was born, there was Flylady. So maybe she doesn’t have a glamorously chic website and maybe she’s not the celebrity that Miss Kondo is, but I like her approach. It’s simple, doable and realistic. She helps organize more than just your closet. She too is a firm believer in Baby Steps, and acknowledges that because our homes didn’t get dirty in one day, it might take more than a day to organize them. She believes in going slowly, establishing a routing and enjoying the process. She even has a 31 day baby step program. Head on over and check it out. I was initially drawn to her because she recommended that everyday we throw away 15 things. I mean, it doesn’t get more simple than that. I first read this about 13 years ago and I really try to do this regularly, maybe not every day perhaps, but regularly indeed. Another great decluttering method is one I heard a few years back at the Architectural Digest Home Design Show. I had gone to hear Nate Berkus promote his then newest book. He had many clients who had loads of clutter. Part of redesigning is getting rid of unused and unwanted items. He suggested a three pile method. You can use this simple process as you go through eliminating excess in your home… start with a closet, and move on to another or a dresser, junk drawers… whichever way you want to until you’ve decluttered your home. You might even be able to make a few extra dollars. Because I really hate to clean I try to do a little bit every day. I vacuum twice a week - this place is a dust magnet and my kids are messy. I clean bathrooms before I hop into the shower. I keep cleaning supplies in each bathroom. Sinks and tubs get cleaned in minutes. Floors get vacuumed and steamed when I vacuum the house. I dust once a week and use Windex on my kitchen countertops at the end of the day. It’s easy for me to do this in small doses and takes almost no time. Instead of cleaning out the entire kitchen at once, let’s say. I’ll dedicate an hour or so to the pantry or the fridge. If I want to keep going I do. If not I stop. Could me home be dustless and spotless? Sure if I hired a cleaning lady, but it could also be a lot worse! I mean, we all know that trying to clean a house with active kids living in it is like trying to brush your teeth with a mouthful of Oreo! If you have any cleaning or decluttering tricks I would love to hear from you! I haven’t made resolutions in years. I’ve set goals, but I haven’t made resolutions. What’s the difference? Aren’t they the same? According to some there is. Goals are milestones and not necessarily permanent. For example, one might say “My goal is to run a marathon this year. My goal is to read a book a week this year.” Resolutions, however, tend to be longer term. They are milestones with a definitive plan. This makes sense to me. For years I’ve been saying “I don’t make resolutions anymore. I don’t really stick to them and so I make goals instead.” Well isn’t that an excuse if I’ve ever heard one! I was all set to do the same thing this year. I loosely promised to eat better. But I never set a plan. And, truth of the matter is I do eat well. I eat tons of fruits, veggies and lean protein. I don’t drink soda or juice and don’t do too terribly with my coffee or alcohol intake. My issue is my sweet tooth. Sugar and carbs are my downfall. Freshly baked cookies, ice cream, a crusty loaf of French bread, a warm, chewy slice of pizza… Those are my great downfalls. Forget about the “Carb Closet” (aka Pantry) filled to the brim with chips, pretzels and everything else forbidden and delicious - that’s an altogether different story. I had my physical last week. I eat well. I work out a lot and hit the gym 5-6 times a week. I’ll often take back to back classes in the same morning. I spin for my calorie torching, high intensity cardio, and do either Barre or Pilates for core and all over muscle strengthening and conditioning. When I am on my bike I push myself til I am breathless. Until the sweat is dripping down my face, neck and back. If I am going to eat more I need to burn more. I texted my doctor and asked her if the weight gain might be the result of one of the medications I am taking. No, she told me. It’s the result of all the holiday food. (Note to self: never schedule a physical on December 28th!) She assured me that by cutting back all would be well and good again. She wasn’t at all concerned. But I was. I am. I know how much harder it is to stay in shape and keep the numbers on the scale down. So now what? Well, for starters, no more excuses! Obviously I don’t need to make sure I get more exercise since I get plenty. But I do need to make sure I stay away from those foods that aren’t good for me. I’m not talking about doing anything drastic or extreme. I don’t believe in fad diets - though if they work for you, then by all means continue. For me, it simply means cutting back on those foods that bother me. I know what they are, yet their hold on me is so controlling that even when I don’t feel well after I eat them, I continue to do so. So I made a resolution for the first time in forever. As of a couple of days ago I completely cut out all complex carbohydrates - breads, cookies, crackers, chips, etc., and sugars save for my morning coffee. I have increased my veggie intake, fruits - especially berries, and continue on my apple a day kick. I’m not really a red meat lover but I had been eating more than I should. I will be cutting out red meat as well, eating chicken and increasing my fish and seafood intake. It’s really simple and not hard. In a few weeks I should be back to my old self. If, I do eat something I shouldn’t, I won’t punish myself, I’ll just get back on track again the next day. If you, like me, have children you know this is all doubly hard and more of a challenge. I have decided that my kids can all stand to have a healthier New Year as well! Take Risks… I have to learn to take chances on those things that scare me. After all, nothing ventured, nothing gained! Write more… I haven’t been writing enough for myself. I will devote at least 2 days a week to my own writing. Declutter my home… Ugh… Our small rental is bursting at the seams and I really need to do something about it. I intend to throw away 5-10 things away a day (or recycle when appropriate) and to fill at least 1 garbage bag every week until we have been decluttered. We have pens without tops, broken toy pieces, old scribbled on note cards, magazines, etc. The kids have toys and games that can all be donated. And that’s it. It’s not a lot but I don’t want to create more than I can handle, even though I have lots more I can improve upon. We need to remember that the idea of the Resolution is to create something achievable. And let’s STOP MAKING EXCUSES! I’d love to know what some of your resolutions are! I’m more of a goals person and less of a resolutions setting type. I set goals that are attainable not those that are so hard to reach that you’re almost set up for failure. Last year I promised myself I would read more. I’m an incredibly slow reader, so while for many a book a week is doable, it isn’t for me. Also, when I read at the end of the day, at bedtime, I inevitably fall asleep after a sentence of two. Determined to make it through more books I decided to listen to some in addition to reading. I have an audible subscription and I am hooked! I love to listen to books at the end of the day. I’ll set the time for 15 or 30 minutes, depending on how tired I am. I also love to listen to books when I drive. The following titles were read or listened to on Audible, or in some cases, a little of both. Below is my list of suggestions in no particular order other than these round up my 10 favorites from last year. I picked up Kitchen Confidential a few years ago at my local library’s book sale. After the great chef’s passing last year I was inspired to pick it up again. I couldn’t find it anywhere and I must have donated it back to the library to be resold. Perusing Amazon I noticed that the title was not only available on Audible, but was narrated by Tony himself. As with the book, I was hooked from the get-go. Bourdain, in addition to being superbly talented in the kitchen is also a beautiful, prolific writer and master storyteller. For those of you who’ve watched his series on television, you are well aware. In this deeply personal memoir, Bourdain not only exposes the underbelly, the nitty and gritty of the New York City restaurant scene, but shares with us many of his own obstacles and personal demons. His battle to the top after many non successes in various kitchens; his battles with drugs and his rocky personal relationships. When Bourdain finally makes it we cannot help but cheer. Rude, crude, abrasive and yet tender, Kitchen Confidential is perfect for those who love memoirs and food. This is one of those reads you don’t ever want to end. Lucky for us Bourdain has penned other books. My daughter read Beautiful Boy in high school and urged me to get it. I promised myself I would finish the book before seeing the movie. Well, I finished the book a while ago and have yet to see the movie! This haunting memoir gives us insight and understanding to what it’s like to parent a child with an addiction. We are offered a real-time chronicle of the shocking descent into substance abuse and the gradual emergence into hope. One needn’t to be in a similar situation to get something out of this story. There are many aspects we all as parents can take away. Sheff's son, Nic, was a varsity athlete, honor student, and award-winning journalist until he discovered meth. He quickly became a trembling wraith, stealing money from his family, and living on the streets. With haunting candor, Sheff traces the first warning signs, the attempts at rehabilitation, and, at last, the way past addiction. He shows us that, whatever an addict's fate, the rest of the family must care for one another, too, lest they become addicted to addiction. I think, for me, 2018 was the year of the memoir. Almost as soon as Small Fry was released I downloaded the audible version. Born on a farm and named in a field by her teenage parents―artist Chrisann Brennan and Steve Jobs―Lisa Brennan-Jobs’s childhood was anything but typical growing up in a rapidly changing Silicon Valley. As a young girl her father, a mythical figure, revered by many, was absent from her life, at first denying paternity until tests proved him to be her father. We see contrasting lives and lifestyles as Lisa and her mother are barely able to scrape by financially while her father rapidly becomes one of the wealthiest men in the country. As she grew older, her father eventually took an interest in her, introducing her to a world of mansions, vacations, and private schools and designer labels. His attention, while thrilling, was wildly unpredictable. He was often cold, critical and selfish in his reasons for giving her attention. A brilliant yet bizarre man lived in a barely furnished home, followed a strict vegan diet and refused to pay her tuition to Harvard. (And when your father is Steve Jobs you certainly cannot qualify for financial assistance.) 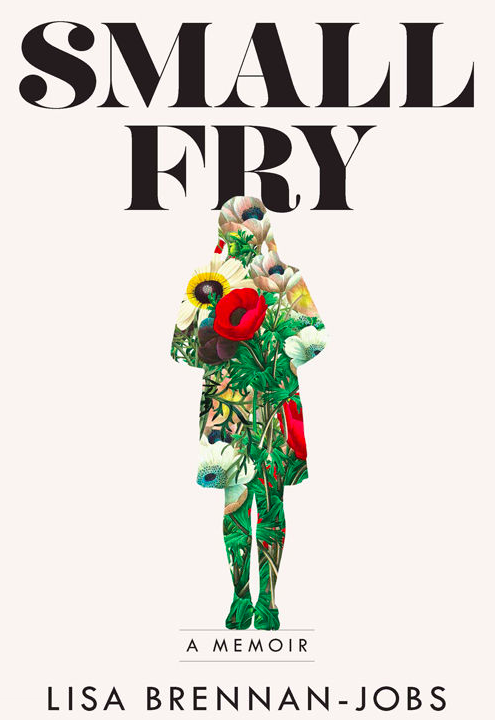 During her teenage years, her relationship with her mother grew strained and she moved in with her father and his new family, always seeking his approval, always hoping he’d become the father she’d wanted him to be, Small Fry is a poignant coming-of-age story of growing up in the 1970s and 80s to one of the most powerful and influential men in the world. Beautifully told, her words weave together a story so colorful, continually shifting our opinions of the late founder of Apple. We have nothing without hope. I first picked up this thin memoir when I was in my twenties. I was not yet married (I hadn’t even met my husband at that point) nor did I have children. Even still there was something about this beloved classic that drew me in. 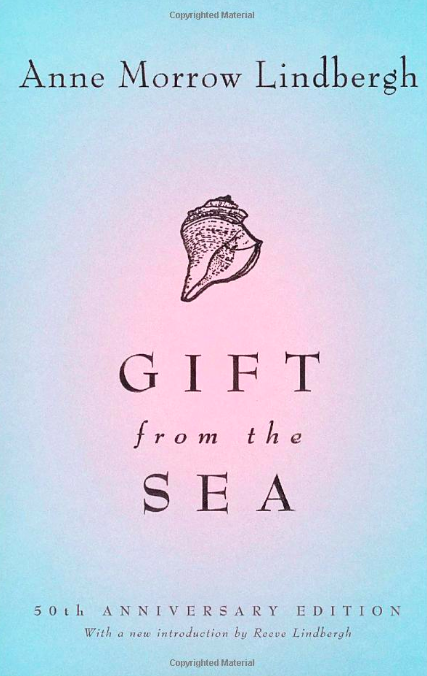 Graceful, lucid and lyrical, in Gift from the Sea Anne Morrow Lindbergh shares her meditations on youth and age; love and marriage; peace, solitude and contentment as she set them down during a brief vacation by the sea. I’ve read this several times since, and I am sure I will read it several times more. Each time I sit down with this slim memoir I am pulled in, like shells to the shore by the tide. Drawing inspiration from these shells on the shore, Lindbergh's musings on the shape of a woman's life bring new understanding to both men and women at any stage of life. A mother of five, an acclaimed writer and a pioneering aviator, Lindbergh casts an unsentimental eye on the trappings of modernity that threaten to overwhelm us: the time-saving gadgets that complicate rather than simplify, the multiple commitments that take us from our families. And by recording her thoughts during a brief escape from everyday demands, she helps readers find a space for contemplation and creativity within their own lives. With great wisdom and insight Lindbergh describes the shifting shapes of relationships and marriage, presenting a vision of life as it is lived in an enduring and evolving partnership. Originally published in 1955, it never fails to surprise me is just how similar our lives are today. Even though so much has changed, so much stays the same, all these years later. At the age of 36, on the verge of completing a decade's worth of training as a neurosurgeon, Paul Kalanithi was diagnosed with stage IV lung cancer. One day he was a doctor treating the dying, and the next he was a patient struggling to live. And just like that, the future he and his wife had imagined evaporated. When Breath Becomes Air chronicles Kalanithi's transformation from a naïve medical student "possessed", as he wrote, "by the question of what, given that all organisms die, makes a virtuous and meaningful life" into a neurosurgeon at Stanford working in the brain, the most critical place for human identity, and finally into a patient and new father confronting his own mortality. My 20 year old daughter introduced me to the writings by this young poet, half Canadian, half Indian, who identifies more with the Gen Y-ers than the Millenials, never mind my over-the-hill Gen X generation. She’s been touted as an Instragram poet. Her poetry is uncomplicated honest and raw has often been touted as too simplistic. But I think that’s what I like about it especially. Quick notes and thoughts on life, love and the human emotion, are easily identifiable across all cultures and generations alike. Much as with Gift From the Sea, I’m quite certain there’s something to be taken with each reading, something different perceived at each stage of life. Rupi’s effortless prose is often accompanied by her beautiful line drawings. Such words of wisdom by such a young talent, it will be fun and interesting to see what her future holds for her. Pick up both Milk and Honey and The Sun and Her Flowers together. 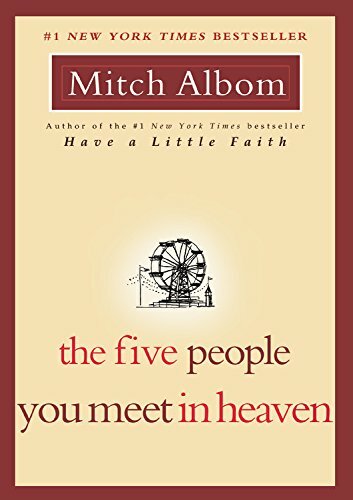 "If you are feeling stuck, lost, or you just need a pick-me-up, this is the book for you. Shriver's wisdom will fill you up." Hoda Kotb, co-anchor of The Today Show writes. Although Shriver turns to religion for guidance and inspiration (I am not a religious person) I still took her book of reflections to heart. She shares her stories for those seeking wisdom, guidance, encouragement, and inspiration on the road to a meaningful life. In this moving book, she shares inspiring quotes, prayers, and reflections designed to get readers thinking, get them feeling, get them laughing, and help them in their journey to what she calls The Open Field - a place of acceptance, purpose, and passion - a place of joy. It’s always nice to know that whatever we’re experiencing, we aren’t alone. I've Been Thinking... is ideal for anyone at any point in her life. Whether you feel like you've got it all together or like it's all falling apart--whether you're taking stock of your life or simply looking to recharge, this is the book you will turn to again and again. Born to survivalists in the mountains of Idaho, Tara Westover was seventeen the first time she set foot in a classroom. Her family was so isolated from mainstream society that there was no one to ensure the children received an education, proper healthcare or intervene when one of Tara’s older brothers became incredibly violent. This dysfunctional family helmed by a father who suffered from numerous psychological disorders, will remind readers of The Glass Castle. Yet if a family could be more bizarre, the Westovers were. It was not until another brother got himself into college, that Tara decided she might like to as well. Her quest for knowledge not only transformed her, but possibly saved her life. Through her studies she traveled over oceans and across continents, to Harvard and to Cambridge University. Educated is heartbreaking and heartwarming - a coming of age novel about determination and perseverance that knows no boundaries, reminding us that it’s often ourselves who get in our own way. I’m a huge fan of Moleskin notebooks and calendars. They’re super portable, well-made and come in a terrific array of colors. I have mine with me at all times. I’m a paper gal and prefer taking notes with a paper and pen over typing something into my phone. If I want to doodle, take notes, or have something important to jot down my Moleskin Notebook never lets me down. I picked up an extra this year and I’m using it for something altogether different. I’ll be using it as a diary of sorts. Not in a Dear Abby secret keeper kind of way. Instead of keeping lists of things to do, I will be keeping lists of everything I’ve accomplished. I find that I look back and often see failures and disappointments of tasks not accomplished instead of focusing on all that I have accomplished. And maybe, just maybe it’ll give me the motivation and encouragement needed to accomplish some of those grander goals. I recently asked a local facebook parents group for some stocking stuffer ideas. I tend to do the same thing year after year. While it’s not a terrible thing, and my troup tend look forward to their silly little nothings, I’d like to change things up a bit this year. So, in no particular order, are some ideas for all ages, both big and small ticket items. Ideally, if possible, I would love you all to try to shop local! I’d love to hear from you - Do you have any ideas or favorite items that I haven’t mentioned? In this literary novel inspired by the events of World War II and one of its heroines, we get to know three young, strong-minded and determined women whose lives, though continents apart, are destined to come together. Hitler's Army has invaded Poland and has its sights on France, forever changing the lives of these three. We are first introduced to Caroline Ferriday, a New York socialite with her hands full at her post at the French consulate and a new love on the horizon. We then meet Kasia Kuzmerick, a Polish teenager whose youthful, carefree days disappear as she pursues her role as a courier for the underground resistance movement. In a tense atmosphere of watchful eyes and suspecting neighbors, one false move can have dire consequences. Then we meet Herta Oberheuser, a young German doctor who responds to an ad for a government medical position. With the hope that this becomes her ticket to a life more exciting, she finds herself confined to the male-dominated underground world of Nazi secrets and power. The lives of these three women are set on a collision course when the unthinkable happens and Kasia is sent to Ravensbrück, the only all-female concentration camp. Their stories cross continents—from New York to Paris, Germany, and Poland—as Caroline and Kasia strive to bring justice to those whom history has forgotten. I'll admit to only being a little more than halfway through Lilac Girls, and while I can't wait to finish it, there's a part of me who wants to slow down and savor it. 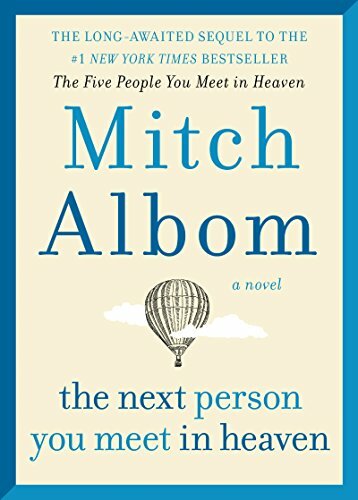 A great read, the story and the characters will live with me for a long time. To order your copy click here! The reason, perhaps, so many of us have trouble realizing goals, sticking to resolutions and achieving certain levels of success is because we aren't specific enough, and the manner in which we look to goals is no different that making a wish, vague and open-ended. In order to be successful, one needs to have specific and realistic ideas in mind. No matter what your own goals may be, whether personal or professional, SMART Goal setting is simple and achievable. SMART is an acronym for Simple, Measurable, Achievable, Realistic/Relevant and Timely. A simple goal is one that is very specific thus making it much easier to accomplish. When setting a specific goal, be sure that is is SIMPLE and be clear on what you want to accomplish. A measurable goal allows you to easily track your progress. An achievable goal is one that can easily be reached. If you have one large, longterm goal, you may want to break it down to smaller goals. A realistic goal is one you can work toward without too much of a struggle. Your goal can be high and realistic, you'll just have to recognize that you'll need to work harder at it and find ways to keep motivated. A timely goal is one with a specific time frame. A goal without a timeframe is, as they say, just a dream. You need to set your parameters. I like creating goals that are reachable within a week or two. Longer, and the chance for failure is greaters. You can use a calendar, weekly agenda or a simple notebook, your goals can relate to anything - career, health, homefront. Give yourself a deadline, write down the date. 5. Weigh yourself at the end of one week. This is particularly helpful if you have a greater goal in mind. By breaking it into smaller, smarter and more achievable goals the more likely you are to see those favorable results. Here's to setting and reaching our SMART Goals! Quote by Martin Luther King, Jr. Many of us have been given the gift of a long weekend, a day off from work. But as we celebrate Martin Luther King Day we should pause for a moment and remember his crusade about social injustice and inequality. A man of many words and quoted often, his words continue to move and inspire so many of us. 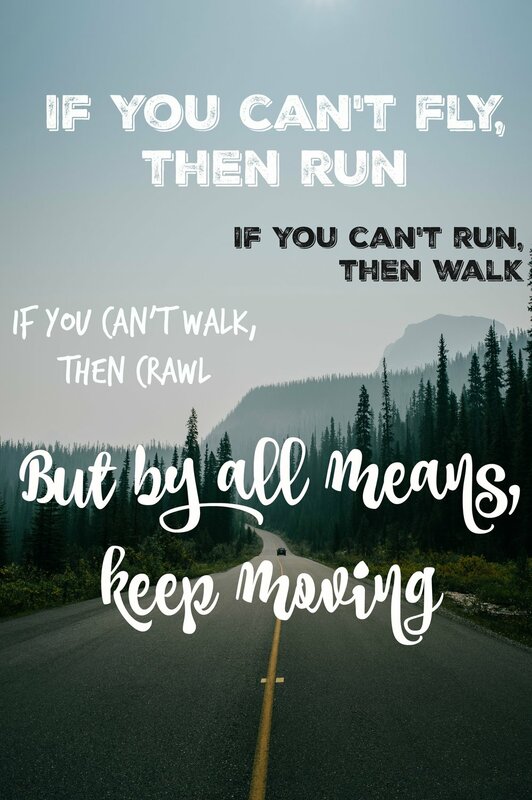 No matter what you're striving to reach - whether personally or professionally, career or fitness - we've got to keep moving forward, whether we fly, run, walk or crawl. Keep your eye on that prize! This New Year Promise to be kind. To yourself! Whether you're making resolutions or not this year, I want you to promise to be kinder to yourself. We, especially women, are our worst critics. We tend to focus on our faults rather than our assets. We tend to be fixated with our weaknesses rather than our strengths. We tend to hone in on our mistakes and failures rather than our successes. Let's all vow, this year - in 2018 - to turn that all around. Let's find and focus on those strengths, successes and all the good things that we have to offer. Let's not worry about perfection, but strive each day to be the best that we can be. Let's stop comparing ourselves to others - comparison really is the thief of joy. Some days you'll be better, stronger, faster than others... and that's ok. Some days you'll give it your all and feel as though you've come short. And some days you'll struggle just to get out of bed, to put pen to paper, to pedal at all let alone with strength and speed... but you made the effort, and effort is more important than success. So this year make yourself a promise to be kinder and gentler to yourself. We're almost a week into the New Year. Many of us have set up goals, and no doubt many of us may have slipped some already. And that's OK. We are tough. We are strong. We haven't failed. So pick yourself up, dust yourself off, and get back on that treadmill, stationary bike, yoga mat... So you had a slice of bread, a piece of chocolate... So what?! Tomorrow's a new day, and there happen to be 358 more of them!